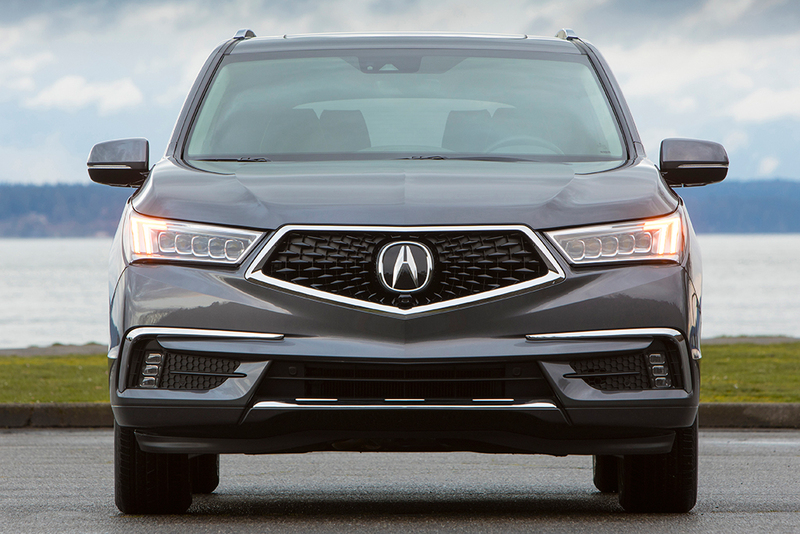 2019 Acura MDX vs. 2019 Honda Pilot: What's the Difference? These two SUVs share an engine and a platform, but there's plenty setting them apart. 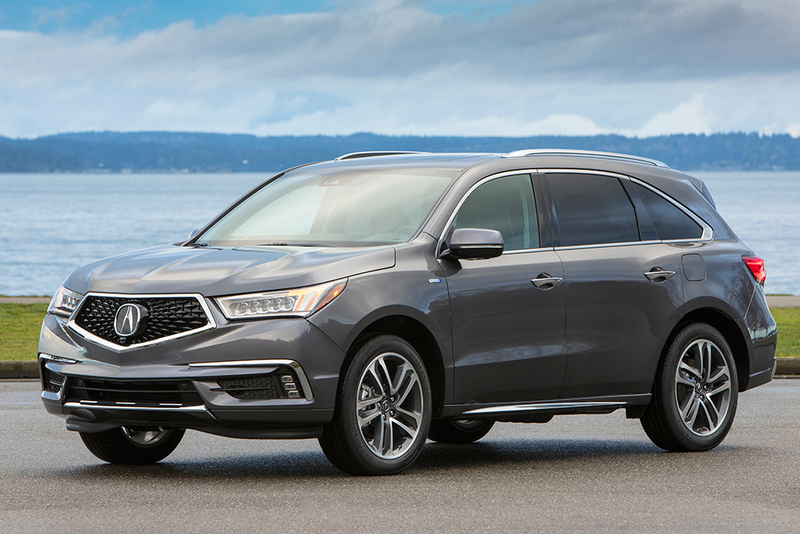 2019 Acura RDX vs. 2019 Acura MDX: What's the Difference? The all-new 2019 RDX gives its bigger sibling a run for its money. The 2019 Acura MDX delivers performance and capability in a luxury SUV with impeccable credentials. The 2019 Chicago Auto Show marks the 30th anniversary of the world debut of the original Acura NSX. 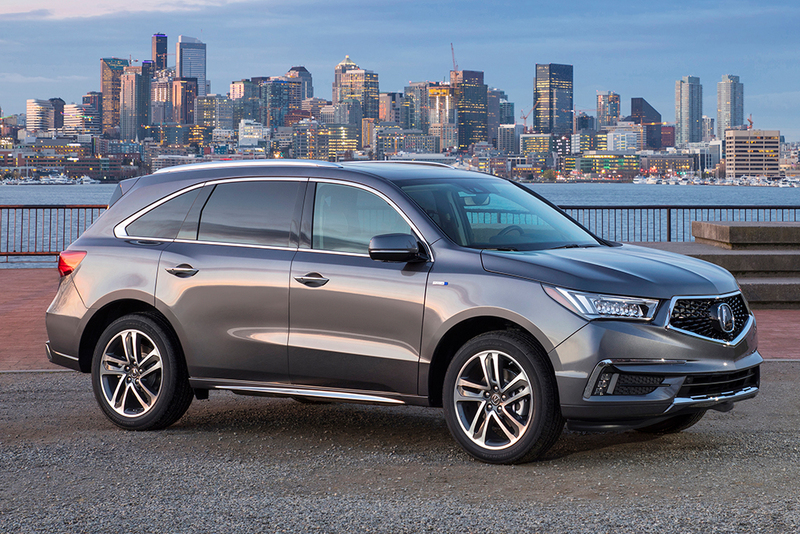 Derived from the excellent MDX luxury crossover, the 2019 Acura MDX Sport Hybrid ratchets up the excitement with a powerful hybrid system, a sport suspension and impressive fuel economy. 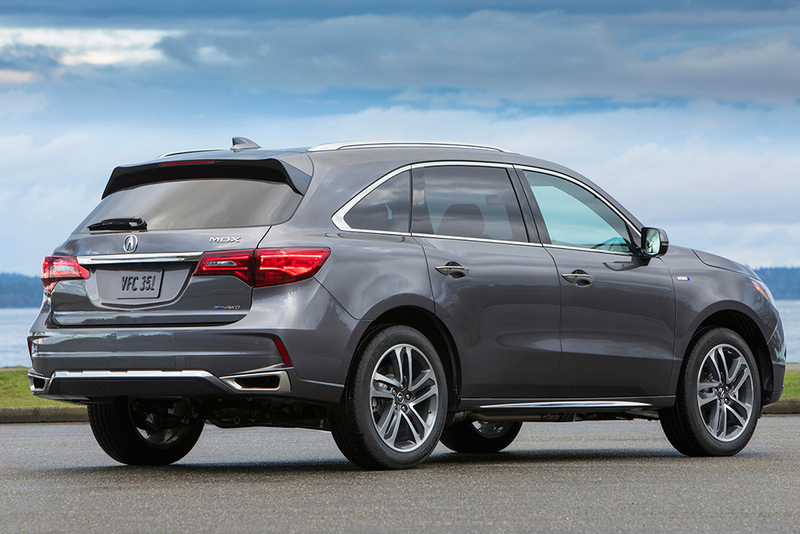 With the same reputation for quality, value and dependability as the standard MDX, the Sport Hybrid ups the playfulness, thanks mainly to the hybrid's clever 3-electric-motor setup similar to that found in the NSX supercar. The hybrid design provides the MDX Sport Hybrid with superior road-holding abilities in all types of weather and adds 30 additional horsepower without sacrificing any interior space. Even the pricing is similar, with the hybrid a mere $1,500 more than the similarly equipped MDX Super-Handling All-Wheel Drive (SH-AWD). In this field, the MDX Sport Hybrid has a few notable competitors, namely the Lexus RX 450hL and, to a lesser extent, the 5-passenger Mercedes-Benz GLE 550e and the Volvo XC90 T8 plug-in hybrid. The 2019 Acura MDX Sport Hybrid is largely unchanged, save for a few new colors that bring the number of choices to eight. Power for the MDX Sport Hybrid is provided by a 3.0-liter V6 engine and a 3-motor electric hybrid system that make a combined 321 hp and 289 lb-ft of torque. The 7-speed dual-clutch automatic transmission has a built-in 47-hp electric motor, with two additional 36-hp motors located in the rear inboard-mounted Twin Motor Unit (for a combined output of 72 hp). The MDX Sport Hybrid is fitted with idle stop/start technology that shuts down the gasoline engine when the vehicle comes to a stop. The SH-AWD is standard, and the fuel economy is an impressive 26 miles per gallon in the city and 27 mpg on the highway, with a combined 27-mpg rating. The MDX Sport Hybrid comes in two well-equipped trims: The MDX Sport Hybrid w/Technology Package and the MDX Sport Hybrid w/Advance Package. The MDX Sport Hybrid with Technology Package ($53,795) includes the 3-motor hybrid system, SH-AWD, AcuraWatch (collision-mitigation braking, lane-keeping assist, road-departure mitigation and adaptive cruise control), the Active Damper System, full LED lighting, an acoustic windshield and front side windows, a power moonroof, Smart Entry Keyless Access, 50/50-split third-row seating, second-row 60/40-split bench seating with One-Touch Walk-In and Extended Slide, leather seating surfaces, a multiview rearview camera, push-button start/stop, tri-zone automatic climate control, hill-start assist, 10-way heated power front seats, adaptive cruise control, a power tilt-telescopic steering column, GPS-linked climate control, 20-inch aluminum-alloy wheels, rain-sensing windshield wipers, power-folding side mirrors with LED puddle lights, remote engine start, the Acura Navigation System with an 8-in color display, a blind spot monitoring system with rear cross-traffic alert, Apple CarPlay, Android Auto and the Acura/ELS Studio Premium Audio System with 10 speakers. The MDX Sport Hybrid with Advance Package ($60,545) adds perforated leather with contrast stitching and piping, heated and ventilated front seats, second-row heated captain's chairs, a second-row center console, a heated steering wheel, second-row manual sunshades, two third-row USB charge ports, LED fog lights, auto-dimming side mirrors, front and rear parking sensors and a surround-view camera. 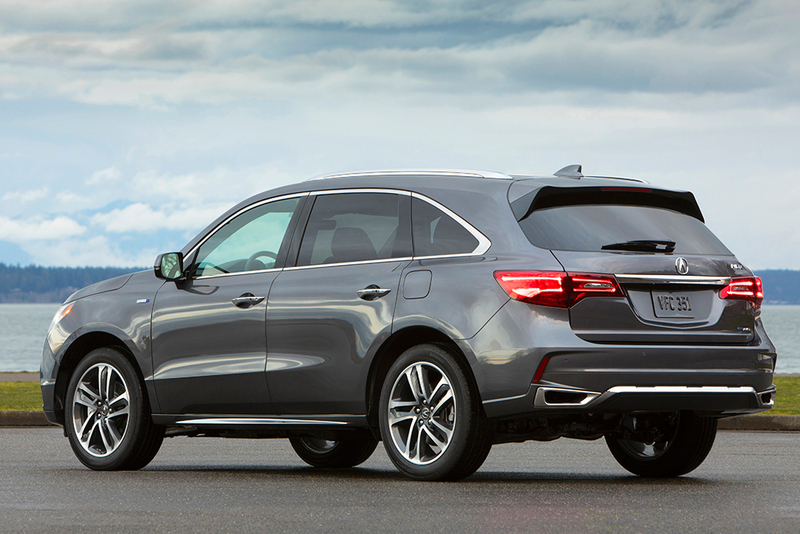 The MDX Sport Hybrid comes equipped with seven airbags, hill-start assist, electronic traction and stability control and a tire-pressure monitoring system. Advanced driver-assist features include lane-keeping assist, collision-mitigation braking, adaptive cruise control, road-departure mitigation and blind spot monitoring with rear cross-traffic alert. Although the hybrid version has yet to be crash-tested, the nonhybrid MDX earned a 5-star overall rating from the government, while the Independent Insurance Institute for Highway Safety (IIHS) gave the MDX its highest rating of Good in every crash test, Superior in the crash-avoidance and -mitigation test and a Top Safety Pick designation. It doesn't get much better than that. Compared to the nonhybrid MDX, the 2019 MDX Sport Hybrid does deliver a more exciting ride. The extra power can be felt both off the line and when performing rapid passing maneuvers. The Sport Hybrid's Active Damping suspension is also more responsive, something we noticed as we breezed through sharp curves at a significantly higher speed than the posted limit, while feeling that we could actually go even faster. Of course, this being Acura, maker of the NSX, the hybrid system isn't simply a way to achieve better fuel economy. No, this system employs three electric motors. One is built into the 7-speed dual-clutch transmission and assists in launching the car from dead stops, also working to recapture energy during braking and deceleration. The other motors are neatly tucked away at the rear wheels, delivering added torque, which in combination with Acura's electronic torque vectoring AWD setup improves cornering and stability. All this electronic wizardry is linked together via Acura's Integrated Dynamic System, which includes settings for Comfort, Normal, Sport and -- unique to the hybrid -- Sport+. So with all of this sporty goodness, you're probably wondering if the hybrid version sacrifices ride comfort in the name of performance. 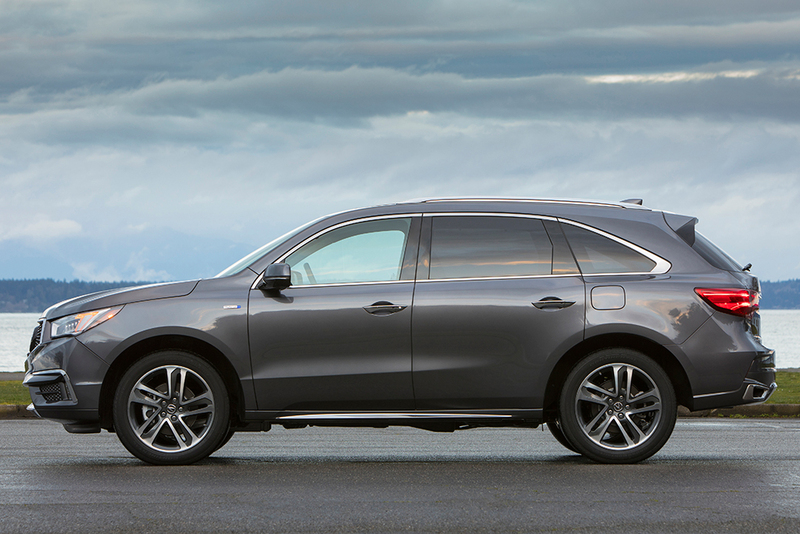 With so many other luxury brands, we've seen it happen, but thankfully that's not the case with the MDX Sport Hybrid. The ride is smooth and controlled, the soft leather seats are remarkably comfortable on long drives and the interior layout is both intuitive and elegant. The MDX Sport Hybrid's ride is smooth and controlled, unflappable in the face of massive potholes and jagged pavement. 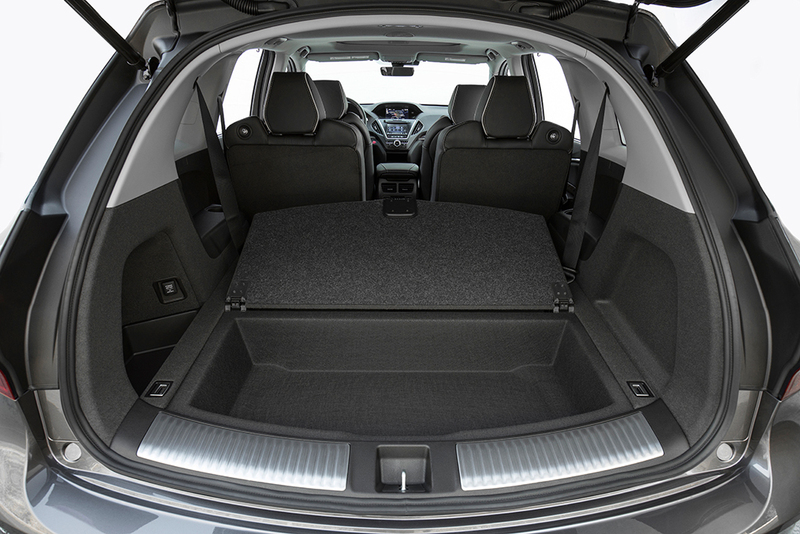 The roomy interior can accommodate adults in the 6-foot range, but the third-row seat is accommodating only to children. Space behind the third-row seat is good, and folding both rows creates a level floor. 2019 Volvo XC90 T8 Plug-in Hybrid -- The Volvo XC90 T8 is a plug-in hybrid, meaning it can run in electric mode for short distances. With 400 hp, the XC90 T8 plug-in hybrid is more powerful than the MDX Sport Hybrid, and its interior is also more refined. The Volvo's price tag, however, is significantly higher. 2019 Lexus RX 450hL -- The RX 450hL hybrid has slightly less power but gets slightly better fuel economy. However, a comparably equipped Lexus costs more than the Acura, and its third-row seat can only fit two people. 2019 Toyota Highlander Hybrid -- While it may lack the performance capabilities and name-dropping credentials of the Acura, a nicely equipped Highlander Hybrid Platinum can do much of what the MDX Sport Hybrid can do, for about $9,000 less. Used Audi Q7 -- A 2014-2017 Audi Q7 offers a superior luxury and driving experience, more engine options and more distinctive styling. We think the MDX Sport Hybrid with the Technology Package is more than sufficient for most buyers' needs. However, if the additional $6,000 for the Advance package is mere pocket change to you, the added features fulfill what luxury buyers expect from a luxury crossover.